Firefighters Chuck Campbell and Dennis McCrea practice using the Jaws of Life. 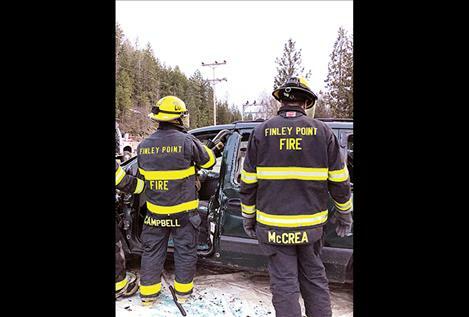 On March 28, the Finley Point Fire Department put their newly acquired Hurst Jaws of Life eDRAULIC battery-operated rescue tools to the test by cutting up two vehicles destined for the junk yard. This line of battery-powered rescue tools is light-years ahead of traditional rescue tools. They require no hoses and no power unit. And because these tools are stronger, smaller and lighter, they’re quicker than ever. Chief Burland reminds drivers to slow down and drive safely. The Finley Point Fire Department is located seven miles North of Polson on Montana Hwy. 35. “We’re always looking for men and women to volunteer,” Burland said. Applications are available at the Finley Point Fire Department across from Finley Point Grill. Inquiries can be made by calling 406-887-2161. Finley Point/Yellow Bay Fire Department can also be reached on Facebook.